Did you know that many more households are less sensitive to fire safety when they are at home. We can see, most do not install smoke detectors or fire extinguishers. 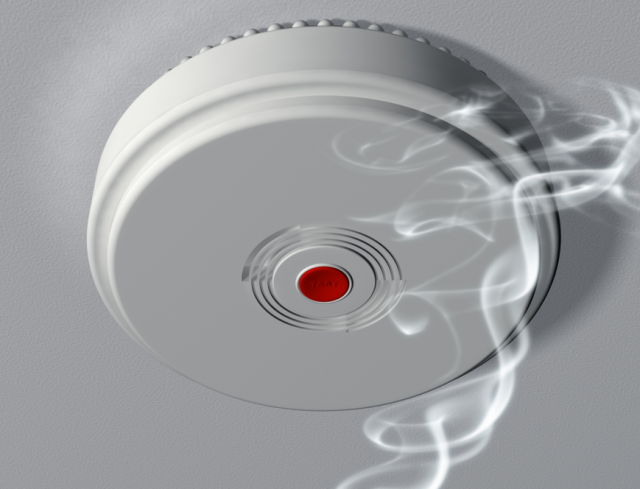 In this article, we share how to install a smoke detector to keep your home in a state of caution in the event of a fire. A smoke alarm can alert you and give you time to escape. Alarms can be wired to mains with battery back up or battery only. Wired alarms are more reliable in the long term. The two main types for home is photoelectric and ionization. Both alarms are very effective, but photoelectric are more effective for detecting smouldering fires. Many homes have the ionisation type installed, however fire fighters recommend that photoelectric type should be installed in bedrooms and adjacent hallways. The location of a smoke alarm is very important. It is necessary to have a smoke alarm in each bedroom as you are most vulnerable in bed. If you or family members sleep with the door closed connect the alarm with others in the house. Interconnecting smoke alarms are especially important when there is more than one story or if the bedrooms are located in different parts of the house. Smoke alarm manufacturers recommend replacing smoke alarms every ten years. If your house has more than one-storey place one on each level and at the bottom of each stair well. Avoid placing a smoke alarm near air-conditioning or heating. The air flow coming out of the unit may blow the smoke away and fail to alert you. Smoke alarms should be installed on the ceiling, but if this is not possible you may install it on the wall. In this case fit it between 6 in. (150 mm) and 12 in. (300 mm) below the ceiling line. Check with the manufacturers instructions if it is suitable for wall mounting. When fitting the smoke alarm near a corner location on the wall, avoid placing it in dead space. The corner can create dead space because it traps hot air and stops it from reaching the smoke alarm. In this case fit the smoke alarm between 12 in. (300 mm) and 20 in. (500 mm) below the ceiling line. For a cathedral ceiling make sure the smoke detector is between 20 in. (500 mm) and 60 in. (1500 mm) from the apex. Check the manufacturers instructions to make sure it is suitable for wall mounting. – Test the alarm weekly. – Clean the smoke alarm and ceiling around it with a vacuum cleaner each month. – Change the battery at least once a year with the battery specified by the alarm manufacturer. Need help from a specialist? Get experienced professional services from Aito Firework. We also supply various types of fire extinguishers throughout Malaysia. Contact us at 03-78314791 for free consultation.